The Chardonnay grape evokes thoughts of Burgundy to many, the place in France where the grape feels right at home, producing wines that at the Grand Cru level are deep, mineral and complex. They have the ability to age like a red wine, and command high prices. To others, thoughts of California come to mind. Here the grape has also made herself at home producing great wines with a little more butter and fat on the edges. These examples also have the ability to age and command high prices. mineral and have the ability to age as long as it’s Burgudian counterparts, or even longer. And they have bubbles! 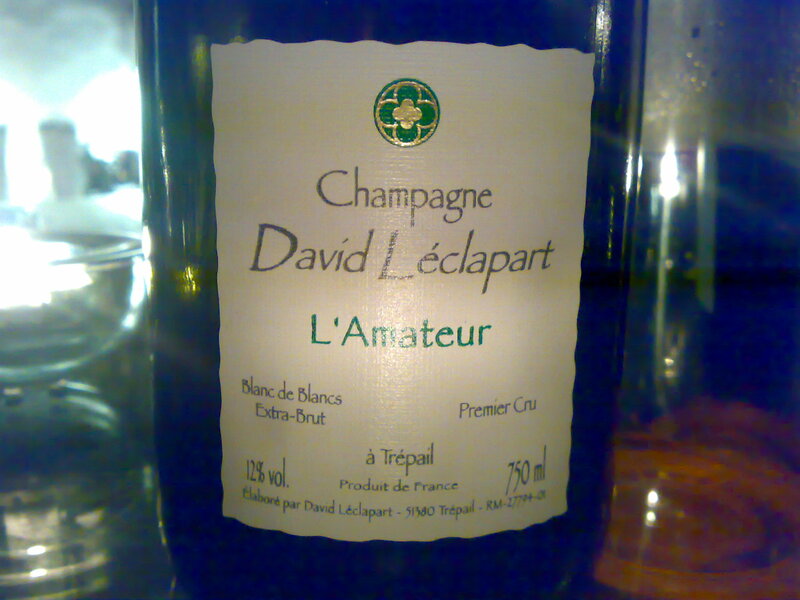 Here I will focus on a small Biodynamic Champagne producer called David Leclapart and his wine called L’Amateur, made entirely from the Chardonnay grape. I have tasted this wine on many occassions, but wrote up this post on March 25th, 2009. I hope you enjoy reading about one of my favorites. David Léclapart is a biodynamic Champagne house located in Trépail in the Montagne de Reims. Montagne de Reims is the home of the Pinot Noir grape, but Trépail is an exception to this rule. Trépail is a Premier Cru village that grows Chardonnay in the heart of Pinot Noir land. David has farmed his 2.75 HA of vines biodynamically since 1998, producing a measly 7000 bottles per year in total, spread across 4 different wines. He uses minimal sulfur and doesn’t filter. This cuvée is called L’Amateur and from what I gather, it’s his “entry-level” Champagne. It’s a blend of Chardonnay grapes from within Trépail. Although the vintage is not clearly marked on the front label, this IS a vintage Champagne. 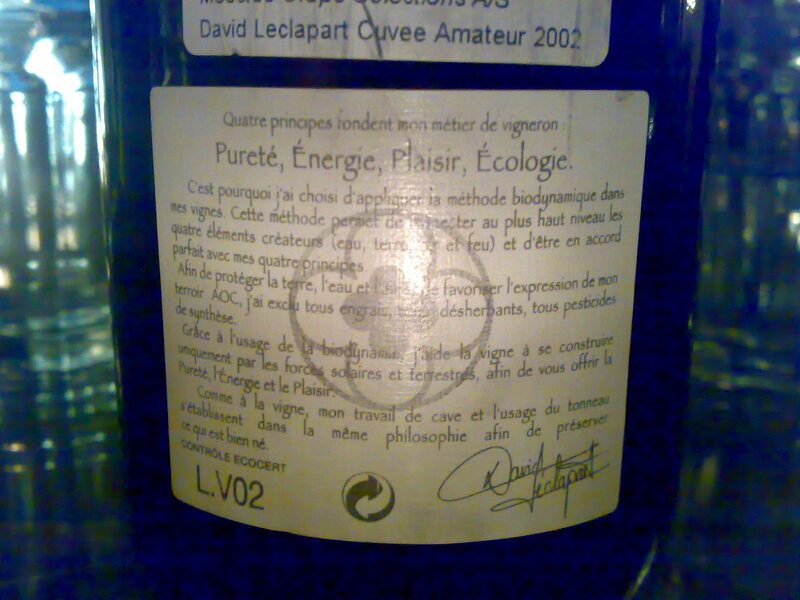 On the back label in small writting you will find “L.V02″. I don’t know how long the wine has been on the lees (yeast), but I would estimate based on purchase date that it spends around 4 years on the lees. This is an Extra Brut (less than 6 grams of sugar per liter). Appearance: Some development showing. Good bubble structure and fine mousse. Nose: I have had this cuvée and vintage on at least 4 other ocassions and this Champagne has really developed in the last few years. Intoxicating flinty minerality dominates with pure green and yellow apples with some citrus overtones. Some honey notes and mushrooms in the background as you might expect to find on a developed Chardonnay. Dampt and you’ll get it. Ton’s of fresh minerals, yellow apples and hints of flint on the palate. Fine and elegant bubble structure. This is what I call a transparent wine. Everything is as it should be and easily understood. The fruit and structure are clean. It’s like cooking that fresh meal using the freshest of ingredients and being able to taste every single one of those ingredients. This is why I like naturally made wines. You can taste what should be in the bottle. David respects four principles: purity, energy, pleasure and ecology. Some say that Champagne doesn’t develop well when it’s given a low dosage (of sugar in the form of grape must) after dégorgement, but this Champagne with it’s very low dosage has developed marvelously and is simply put, is impressive. I have always loved this Champagne and this experience was no exception. I did feel however, that it was at or very near it’s peak, so if you find a bottle of the 2002, buy it, drink it, enjoy it! Joseph grew up in Italy and California, but left The States in 2002 and now resides in Norway. Although Rhys is a relative newcomer in the California wine industry, due to the intuition, diligence and financial resources of owner Kevin Harvey, Rhys is at the forefront of California’s biodynamic and cool-climate wine growing scene. Indeed, in the short time Rhys has been on the market (first commercial release was 2004) it has garnered much attention. Not just from assorted blogs which put them as the next cult producer to watch also from well-respected critics such as Josh Raynolds of IWC, and Allen Meadows . Most recently, Rhys has also drawn comparisons with “the finest red Burgundies” from Mike Steinberger both. The list of accolades goes on here. Regardless of the hype, I am really looking forward to my next adventure traveling the world to research and learn biodynamic viticulture and non-interventionist enology and could not think of a better place than Rhys Vineyards. 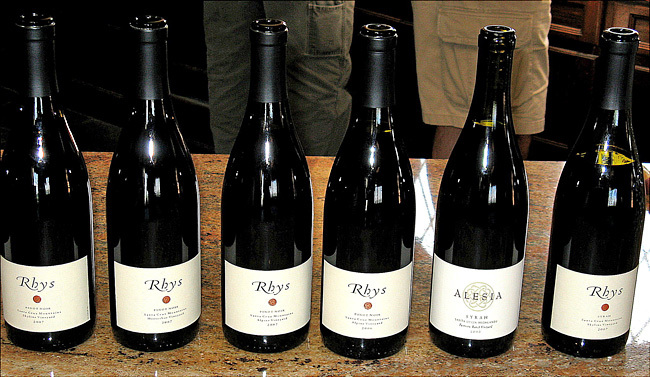 Rhys Vineyards (pronounced REECE) is comprised of just over 40 acres of Pinot Noir, Chardonnay and Syrah from five distinct sites throughout and close to the Santa Cruz Mountains AVA, a rather quaint but diverse viticultural region just south of San Francisco. 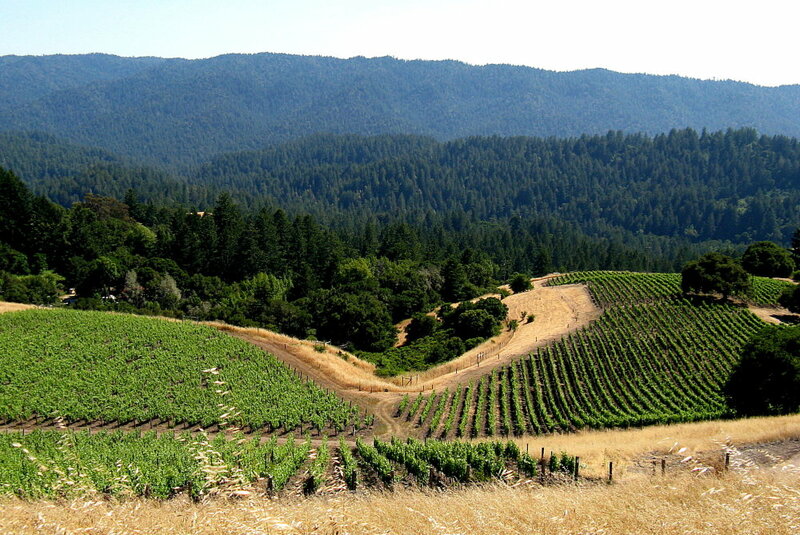 The Santa Cruz Mountains, long overshadowed by Napa and Sonoma, is defined by a mountain range, a major fault-line and two resultant main points of difference in terms of grape growing: climate and geology. Due to the proximity to both the Pacific Ocean and San Francisco Bay, the Santa Cruz Mountains are defined as a temperate, or cool, climate region. The degree days in the Santa Cruz Mountains are similar to that of Champagne, France, Côte-d’Or, Burgundy, France, and Friuli, Italy as well as Willamette Valley, Oregon, Tasmania, Australia and Marlborough, New Zealand. The region, as it’s name might suggest, is mountainous. Rhys has found three micro-climates at different altitudes which imprint the vines with distinct characteristics. The temperate climate typically encourages early bud break and due to the proximity to the ocean, fog tends to roll in some sometime in the late afternoon, until the sun burns it off the next morning. This allows the grapes to ripen in cooler temperatures and the longer growing season allows the grapes to mature slowly with intensely complex flavor. Anyone who has been on a hike up a butte or small mountain knows how temperature going down and up as you ascend or descend. Image how this can impact the flavor, aroma and texture of a Pinot noir grape! What is at work here is the rather extreme diurnal variation, or the difference in temperature between day and night. This is what helps retain acidity in grapes and allows for a slow, even-ripening of both flavors and sugars. The second point of difference, soil and geological formations, are both more complex and, according to Kevin Harvey, more essential in terms of determining the quality and character of Rhys wine. The Santa Cruz Mountains are largely the result of compressive uplift caused by a leftward bend of the San Andreas Fault. What this means is there is an amazing diversity to geology; it’s almost like there are two different geological worlds on each side of the fault, from the top soils to the subsoils and clear through the regolith to the bedrock material in the Santa Cruz Mountains. This fault-line soil diversity sets the Santa Cruz Mountains apart from much of the rest of California. To determine what sites to plant, Kevin Harvey did a huge amount of research using geological maps of the Santa Cruz Mountains and looking at climate studies (he originally placed more importance on climate than he would now). 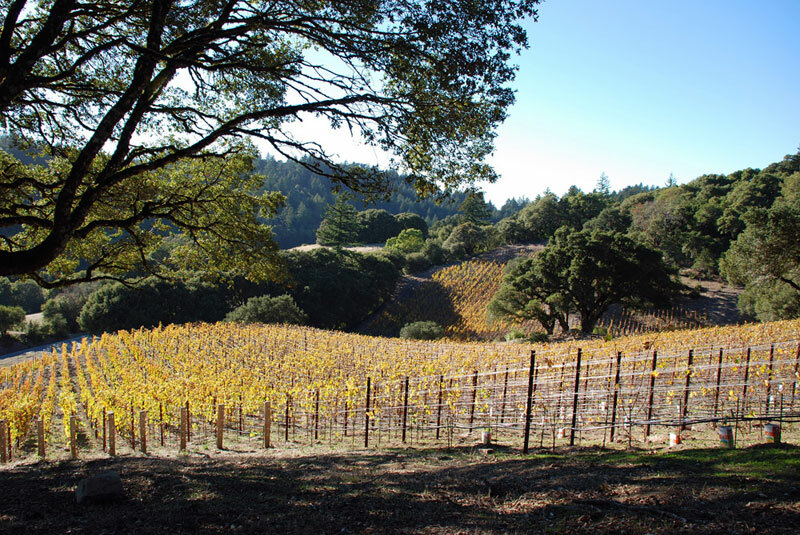 After doing his homework, he found sites that had interesting geological makeup and beginning in 2001 began an ambitious planting program that would eventually yield carefully chosen sites which are now producing distinctive and transparent wines from throughout the Santa Cruz Mountains. 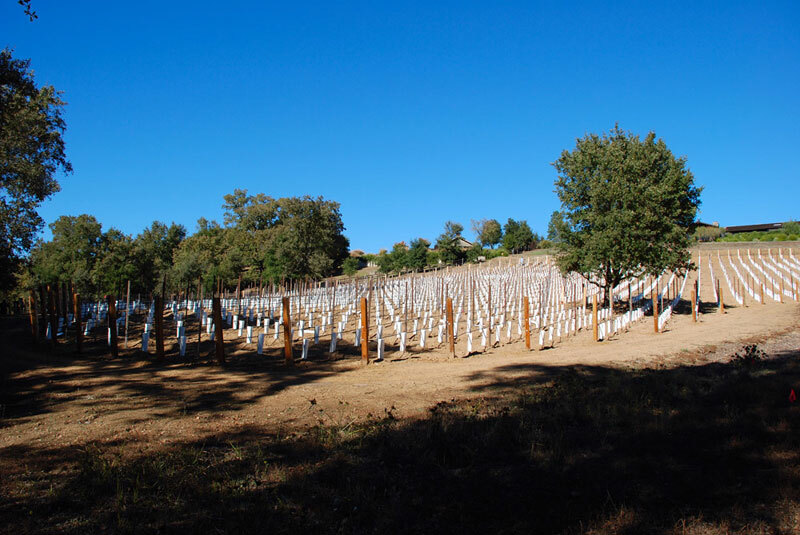 Family Farm and the Home vineyards are planted at the lowest altitude micro-climate, at 400-500 feet with two different loam soils on bases of decomposed sandstone. These two vineyards are not officially in the Santa Cruz Mountains AVA, due to their low elevation. Family Farm Vineyard was planted in 2002 and is 6.2 acres. Home Vineyard is where the oldest vines are planted; 1/4 acre was planted in 1995 and 1998 to 6 clones . In 2007, Home Vineyard was expanded by adding 1.4 acres of very tightly spaced rows of “Suitcase” clones. Horseshoe Ranch Vineyard was planted in 2004 and is 17.5 acres; there are 10 acres of Pinot Noir, 4 acres of Chardonnay and 3 1/2 acres of Syrah, Word on the street is that 1 acre of Syrah was grafted over to Nebbiolo in 2008. Alpine Vineyard was planted in 2001-2003 and comprises 13 acres of shallow rocky soils. This vineyard is very steep and has very low average yields. Clones: 4 Chardonnay and 16 Pinot Noir primarily “Heritage” and “Suitcase” selections, including Calera, Swan, La Tache, Hyde and Wente. Geology: San Lorenzo formation is Oligocene (like Vaqueros) or Eocene, approximately 34M yrs old. Ability to age and improve in the bottle. Nothing compares to the aromatic beauty of aged wine! Consistent with our organic/biodynamic approach to viticulture, we believe that hands-off winemaking provides for enhanced vineyard expression and complexity. At harvest, all grapes are picked into shallow 500lb bins to minimize fruit damage. Each cluster is rigorously sorted by hand and gently dropped directly into our small stainless steel one-ton fermenters. This methodology insures that only the best grapes are used, and allows us to have many unbroken grapes for our whole cluster fermentations. We do not add any yeast or supplemental nutrient in order to allow the native yeasts from each vineyard to perform a completely natural and biologically diverse fermentation. Once fermenting, our wines are gently punched down by foot in small one-ton, open-top tanks. These small tanks allow us to evaluate each of our half-acre vineyard blocks separately, as each fermenter produces a 2-barrel lot of wine. This micro-vinification allows for a rigorous selection of barrels for vineyard designates as well the isolation of blocks with unique character within our vineyards. In the cellar, we employ barrels built from the finest French Oak that have been air dried for four full years in Burgundy. This expensive program requires that we purchase our oak as stave wood 4 years before the barrels are even made, but accomplishes two important goals: very consistent barrels year after year, and wines that are differentiated entirely by the vineyard and not by the barrel. The resulting barrels are extremely gentle and help raise our wine with pure fruit rather than noticeable oak flavor. Our process, from harvest to bottling, is based on a gentle gravity system and our wines are never pumped, fined, or filtered. This gentle approach is intended to deliver the purest possible reflection of our vineyards’ unique character in each bottle. 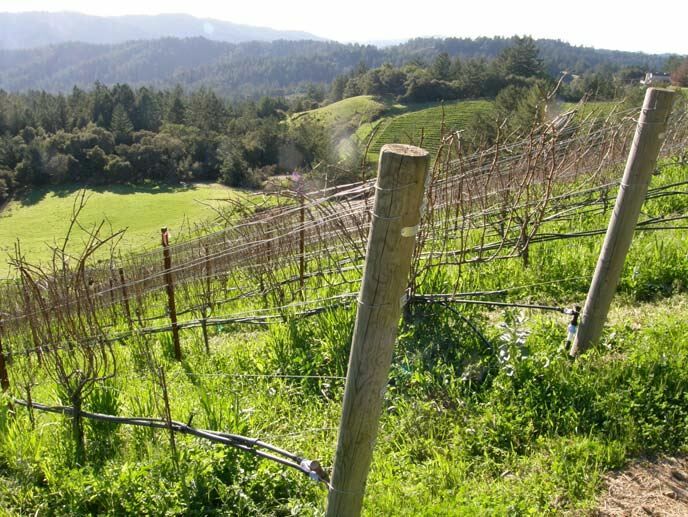 The cool climate and the distinct geological profiles of each vineyard as well as the biodynamic/organic viticultural practices combined with gentle but exacting winemaking techniques helps to explain why Rhys Vineyards wine has received the attention that it has to date. I’ll post my own notes on the wines soon, hopefully! Rhys Vineyards sells all wine through their mailing list. And there is a waiting list to get on the mailing list. You can get your name on the list here. Here are three videos (taken by a wine blogger and connoisseur named Richard Jennings, whose blog RJ on Wine is very well done), from a recent visit to the winery, where owner Kevin Harvey leads a tour and talks about how Rhys uses their new constructed cave throughout production as well as touching on general philosophies and specific techniques for their Pinot Noir, Syrah and Chardonnay. – micro-fermentation: the main fermentation vessels are open-top, 1 ton stainless steel fermenters. This allows 1/2 acre blocks to ferment separately. Other than all this, I am really looking forward to getting back into the vineyard and winery to learn how vignerons and vintners are growing and producing world class Pinot Noir and Chardonnay. Visit the Rhys Vineyards website here. Depending on your source, Rudolf Steiner was either born in Austria on February 25th or February 27th, 1861 (he died March 30th, 1925). Rudi was blessed with amazingly active mind and imagination. Throughout the course of his life he made enormous impacts into fields as diverse as education, economics, architecture, spiritual mysticism, esoteric philosophy, and agriculture. For a biographical introduction to Rudi, this is a great resource. Some of his ideas and theories are easier to grasp than others. In the early 1920’s, he was approached by a contingent of practicing farmers concerned with soil health. What followed was the genesis of biodynamic agriculture. An important point to take into consideration at this juncture is that Steiner was not a farmer. But yet he spoke about farming. And for many people, his philosophy regarding the spirituality of agriculture resounded deeply. One hundred fifty years later, his ideas have matured and to this date, they have never been as popular or as contentious. 1) View the soil as a living organism; bring life to the soil with high-quality compost and without the use of chemical fertilizers or pesticides. 2) Allow oxygen to penetrate the soil strata. Repeated use of heavy machinery tends to compact the soil. Using light machinery only during certain periods is advised. Certain growers go as far as hand hoeing and utilizing draft horses for tilling. 3) Help the soil digest the oxygen and fresh organic matter by utilizing various preparations made of cow dung and plants during specific periods of growth in order to build a hearty microbial population in the soil. By viewing the soil and farm as living organisms, a farmer can improve the entire ecosystem’s vitality, thereby conceiving higher likelihood of a robust, ‘natural’ crop. Biodynamic agriculture aims to make the farm a closed system; all inputs ideally come from the farm or close to it. No chemical fertilizers or pesticides are used, instead biodynamic preparations are employed to assist the plant or vine during specific periods of growth, many times in tune with the lunar cycle and/or to address the root issues of certain maladies or deficiencies. The preparations are simply to help show the vine in what direction to focus it’s energy. 500 Cow manure fermented in a cow horn, which is then buried and over-winters in the soil Sprayed on the soil typically at a rate of 60 g per hectare in 34 litres of water. Note: All these preparations are diluted and then activated or energized by a special stirring process known as ‘dynamization’. 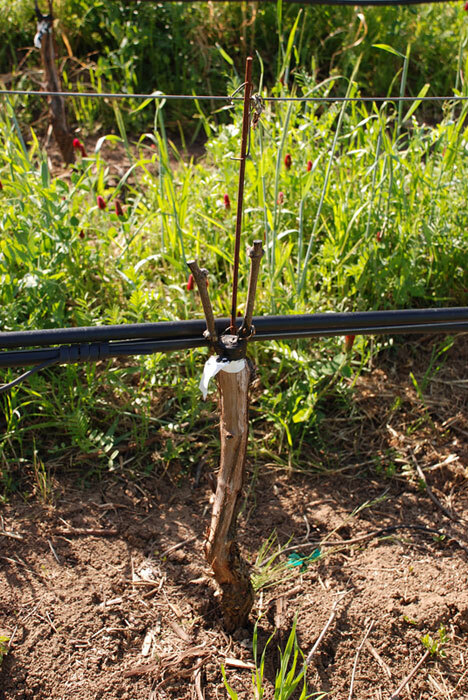 As a result of the listed tenets, biodynamic viticulture usually requires more labor than conventional and organic viticulture. This labor means more time nurturing a visceral connection to the plants and place. Application and execution are another bag of worms. For further reading, an in-depth yet rather quick read on the fundamentals of biodynamics is here. This ‘moral high ground’ is just as much a reality of a powerful philosophy such as biodynamics as religious zealotry is a reality of the world’s major religions. Simple soil analysis has shown that biodynamic soils contain 10 times more micro-organisms (measured in weight) that normal organic soils. See the studies from Biodyvin here. There have also been other studies, which, generally, come out in favor of biodynamics. See this article, here. But, firm proof that biodynamic soils are better? Does it matter to most biodynamic vignerons that science may not ever prove they have it right? “… rigorous research on biodynamics faces a number of obstacles. First, because biodynamics sees the whole farm as a single ‘organism’, the idea of separate, adjacent plots being farmed by different methods, in a trial-type scenario, doesn’t really fit. A second difficulty is persuading research funding agencies to pay for these studies. Professor John Reganold, a scientist at the University of Washington (Pullman) who is one of the leading authorities on organic agriculture, told me that some of his research proposals have been vetoed by funding agencies because they have contained the word ‘biodynamics’. ‘Many scientists who won’t even look at biodynamics’, he reports. SQUARE PEGS IN SQUARE HOLES. ROUND PEGS IN ROUND HOLES. The fact that biodynamics is largely unquantifiable by modern science is why people like Stu Smith have such a hard time accepting it. Regardless, most Biodynamic vignerons (who make some of the most well-renown wines in the world) swear by the general methods and guidelines, though each usually has their own special take on preparations, lunar cycles so on and so forth based upon experience, site needs and fervency. IS THERE A TRUTH IN BIODYNAMICS? Biodynamics, via a spiritual and biological approach to farming, utilizes natural inputs, labor and knowledge of ecological and lunar cycles to grow crops. Practitioners swear by it, otherwise, they wouldn’t go to such lengths. Is it a bad thing to create more sustainable crops by understanding, utilizing and optimizing nutrient pathways and natural forces to maintain balance and improve capacity of farm ecosystems? But to be certain, I fly to New Zealand today and will find out how the practical application is going. I’m spending some time visiting wineries and talking with winemakers, viticulturalists and other folks involved in grape farming in order to understand how Biodynamics is doing in New Zealand. I dedicate my efforts to Rudi’s legacy, because his overall contribution to the world is astounding and his foresight into some of our current issues was spectacular. Disclaimer: I am not a farmer. I do not have a degree in agriculture. I am just a student of wine trying to make sense of Biodynamics. Thanks to the resources (websites I link to) and to all the passionate drinkers, growers and winemakers who I’ve spoken to, and those I have not yet had a chance to talk with. Sorry if I offend anyone. Please feel free to comment or correct me.